Family comes in all shapes and forms. 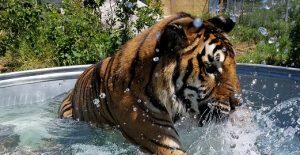 This Christmas Day, as many were with family and friends, our sanctuary family sadly had to come together to help tiger Zeus get his wings. There isn’t a day of the year, hour of the night, or a holiday that our staff isn’t there for our cats. This Christmas was no different. When Zeus needed us, we were all there to help him on to his new wild life. At almost 19, Zeus had a good life. But the most special thing about Zeus was all the good memories he gave us. 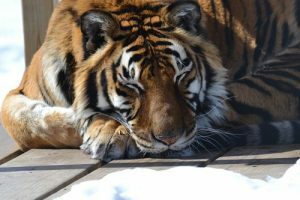 Even though he was a very calm tiger, he had a big personality and presence. He enjoyed giving joy to others. From the moment we met him in 2006, he became part of our family. He never missed a moment to say hello, trot along the fence and made sure to put a smile on our faces. He did the same for volunteers, interns and donors. Zeus had as special friendship with every person he met. Zeus was full of life and happiness. He chuffed continuously, honked hello, and showed us his belly. He made the most out of every day for himself and for us. He loved enrichment, paw painting, swimming. But most of all, he loved his transport crate and seeing other areas of the sanctuary. Zeus had lived in many habitats over the years, and had fun in every one. He liked all the neighbors he met, except for Ekaterina – she was naughty to him along the fence, and that was the end of that. He never went near her again. Even in his last days, Zeus made us happy. We saw him slowing down, he had arthritis and some GI issues. But just a few days before he left us, he had a burst of energy and was playing in his habitat, trotting down the fence and chuffing away. In that moment, we hoped he was getting better, but in reality, it was his last hurrah. He quickly declined after that day, and pain medication could no longer make him comfortable. Even when we knew it was time to say good-bye, he still had it in him to chuff to us, because that was Zeus. With the help of our vet team, he left us peacefully and calmly as he led his days. He told us when it was time, another gift he gave us. And we will always have our special memories, but there will never be another Zeus. His contagious joy will be missed every day! So how did Zeus find his way to TWS to bless us with so many wonderful years? It was in 2006, when I heard a facility in Texas was financially failing and they had over 60 big cats. Back in 2000, we took in our first tiger, Meme. Other cats, including Meme’s son and an intact female, had been placed at this facility. When I heard of their problems, I flew down to see how I could help. Sadly, the only help I could provide was finding sanctuaries for over 60 big cats. There was no saving the facility. I asked about Meme’s son and companion, and was informed they had passed away. I was introduced to Zeus by very compassionate caregivers. They informed me he was born at the facility, which was unexpected since the animals weren’t supposed to be allowed to breed. 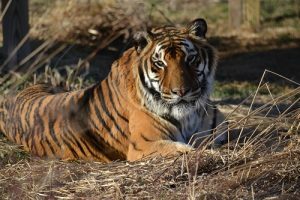 I will never know if Zeus is related to Meme, but something brought me to him and to the other big cats in need. It was one of the largest placement efforts in our industry and was the first time in history we were able to get coordination of dozens of sanctuaries working together. I was able to coordinate placement of all the animals through collaboration and support of so many sanctuaries. TWS became home to 9 of the cats including Zeus, Sierra, Ekaterina, Layla, Lakota, Harley and Salem. Our family always changes with each passing. Luckily, our hearts are limitless. There is always capacity to show another animal our human compassion. Thank you for being a very special part of Zeus’ family. We know how much Zeus meant to you, too. 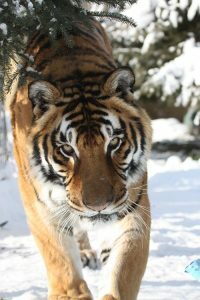 Zeus, a Bengal tiger, has called TWS home since 2010. He was born in 1998 and arrived here with five other big cats and three bobcats. They were all living at Wild Animal Orphanage in Texas, when they were forced to close their doors. In all, over 400 animals were rescued with this shutdown. Zeus is a very special guy, his goofy personality can make anyone smile. He was born in captivity, hand raised and has only ever known people. While he has lived next to other tigers, he really isn’t too sure about them. He is very chatty with people though and often moans and chuffs to anyone in hearing range. He is very laid back and enjoys playing when he is in the mood. Plastic kiddie pools are his favorite- when the keepers put one in his habitat he immediately runs and dives into it and begins licking it and rolling around. He is irresistible and everyone who meets him instantly falls in love. You can help provide daily care for Zeus by becoming his sponsor. Your generosity will be greatly appreciated.